PS4 Pro: Should I Buy? Sony has finally pulled back the 4K curtain, announcing the PS4 Pro to some praise and quite a weighty amount of scepticism. Not an entirely new generation of console, the PS4 Pro (previously regarded as the PS4 Neo or Playstation Neo by third-parties) aims to provide the same Playstation experience in a premium fashion. This is the first key consideration with the PS4 Pro, considering that Sony is advertising it quite proudly as the ‘super-charged PS4’. Firstly, the CPU appears the same at first glance, with an 8-core AMD Jaguar processor inside each model. The PS4 CPU is clocked at 1.6GHz and although Sony announced an increased clock-speed for the Pro, remaining on the exact same CPU architecture means that even notable increases in clock speed won’t have earth-shattering performance implications. Secondly, and thankfully, the AMD Jaguar 8-core GPU appears to have been given a solid bump in performance. Now harnessing double the number of GPU cores – 36 up from 18 – and able to push 4.2 Teraflops of information, over the current 1.84 Teraflops, the PS4 Pro’s graphics processor should give much more headroom to create incredible visuals. One big concern is whether this will be enough to truly deliver 4K gaming; there are 4 times the number of pixels to account for each frame and only (approximately) 2.5 times the graphical grunt available to achieve that in. There has been talk of upscaling being a key component to achieving the look of 4K in games. The only other change lies in the HDD size, which has been set to 1TB – PS4s originally had only 500GB, but a 1TB model was made available to provide additional storage. Memory remains the same between models, with 8GB of GDDR5 available for use. Above we can see the physical size difference between the varying resolutions. 4K displays have 4 times the number of pixels that need powering - the PS4 Pro will need to be well-equipped to handle the 8 million pixels. The big stumbling block for many has been the announcement that the PS4 Pro will not be equipped with an Ultra HD Blu-ray player. This has come at quite a surprised considering how overt the push for 4K is from Sony, but it has likely been omitted for cost reasons or as a result of trend data analysis on physical and streamed 4K content usage. For the average user, this means that you’ll need to use streamed media for your 4K fix. 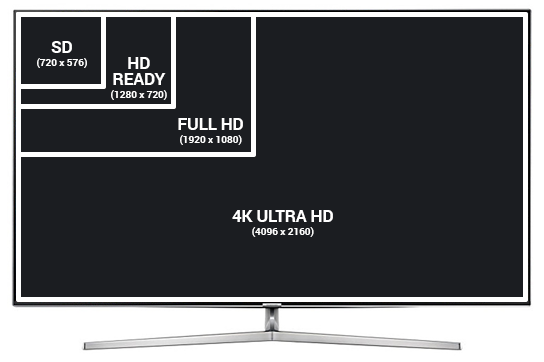 Fortunately, both Netflix and YouTube will have 4K apps ready to make the most of your Ultra HD TV. Amazingly, Sony has managed to offer the PS4 Pro for just shy of £350. Considering you are looking at around £260 to pick up the current console, this is a huge achievement and will be an important fact to think about when looking to join the Playstation family. For newcomers, it seems like the only logical option is to invest in the Pro, though existing users might want to hang on until the verdict is out. The PS4 Pro has been given a street date of November 10th 2016 – far ahead of anything we anticipated. No doubt a strong bid to make the most of the holiday period, Sony will likely reap the rewards of coming to market early with this mid-generation refresh. For any hardware enthusiast looking for the very best gaming experience, there is a great deal of danger in picking up a PS4 Pro on launch. It is common knowledge that Microsoft has their own 4K gaming machine planned for a 2017 launch, with one large piece of information having been revealed by them so far. 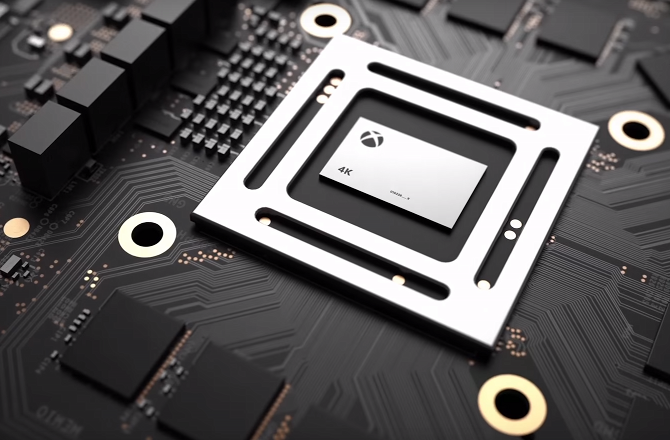 Microsoft boastfully announced that the currently named ‘Project Scorpio’ will push 6 Teraflops of computational performance – over 40% more than the PS4 Pro. This could create the biggest disparity in console power between the two console lines ever, which will make lives as a developer much more difficult when creating multi-platform (and now multi-architecture) games. As a consumer, switching brands could prove to be a painful process, especially as Sony has ensured complete compatibility between the various PS4 systems – up to now, Sony has been winning the units sold war, which might help them to maintain a lead in spite of the lower theoretical performance ceiling. Additionally, the PS4 Pro will have quite some time alone in the market to gain a foothold, which could hurt Project Scorpio quite a bit if it doesn’t make a massive impact on arrival. It’s an unprecedented time in the console market. Never before have we seen a mid-cycle updated to a generation that will have this impact – a fractured ecosystem where up to 4-5 systems need to be accounted for will put a great deal of added development into games, along with more troubleshooting and playtesting. Furthermore, the number of hardware variables bloats rapidly, making it much tougher to provide a uniform experience that has been a strong selling point of consoles for years over PC gaming. Conversely, the creative freedom given to developers could deliver some incredible experiences for us as gamers. It is also a positive sign that performance is important to our experiences; PCs have long towered above consoles as the king of visual quality and closing the gap will mean only good things for all platforms. With a release date looming so close, we will see first-hand how much of a leap in quality the PS4 Pro will deliver. If you already own a PS4 and don't own a 4K or HDR-capable TV, the PS4 Pro is probably not a purchase you need to invest in. If you've yet to pick up a PS4 and have been thinking about it, we'd recommend holding tight and picking up a PS4 Pro - regardless of your TV - when it launches November 10th 2016. If you’re looking to get Pro-ready, check out our incredible range of Full HD TVs, 4K Ultra HD TVs and HDR TVs to give you the best gaming experience possible.